The Israeli practice of using dogs to terrorize Palestinian civilians has been documented once again in a shocking video that should galvanize international watchdog groups and governments to action, says Euro-Mid Observer for Human Rights. A video documenting Israeli soldiers send two dogs on a Palestinian boy who looks visibly frightened has been spreading across the Web. Hamza Abu Hashem, 16, was detained by Israeli soldiers in December for allegedly throwing stones at Israeli forces in the town of Bait Ummar, in northern al-Khalil. In the video, for which the origin is unknown, the boy is seen screaming in pain and fear while being held by Israeli soldiers. One of the soldiers can be heard making fun of the boy, saying, “Who is the coward now, huh? Who is the coward?” Another soldier incites the dog to bite the Palestine child by saying, "get him." Later, Hashem was taken to an Israeli hospital, then moved to Ofer prison and sentenced to 18 months in prison. The Israeli army has responded to the outrage over the video by declaring that it has opened an investigation into the incident. Euro-Mid Observer for Human Rights warned that the Israeli policy of siccing dogs on civilians is brutal torture and inhumane treatment that violates international law, including the Fourth Geneva Convention (1949) and the Convention against Torture (1984). The organization called on UNICEF to comply with its obligation to protect Palestinian children by pressuring the Israeli government to cease its inhumane practices. Dozens of Jewish settlers last night spread throughout the vicinity of Jalama village, north of Jenin city, and along al-Naserah road in the presence of a large number of Israeli troops in the area. Local sources said that the Israeli occupation army was conducting military exercises in the area in cooperation with a group of settlers. They added that the Israeli troops were training with the help of settlers on how to subdue Palestinian protesters and set up ambushes to arrest them. The sources pointed out the drills also took place in cultivated lands in the area. 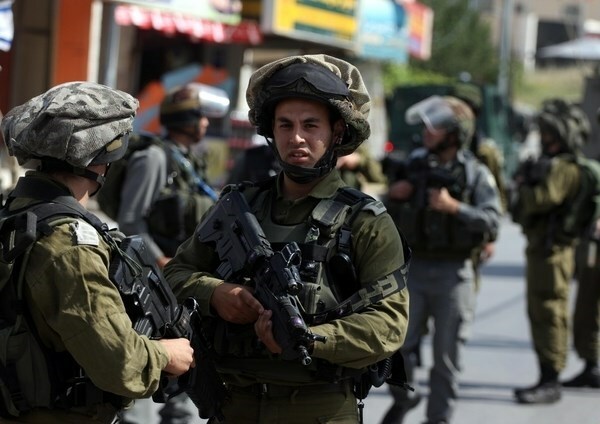 The Israeli occupation forces (IOF) on Monday blasted open the doors of Palestinian homes and ransacked them in Halhul town as part of military drills that had started two days ago. Local sources said that Israeli soldiers detonated the doors of Palestinian homes belonging to the families of al-Qawasmi and Shahin in al-Hasaka area near Halhul and many of them were deployed in nearby heights. According to the sources, the Israeli occupation army admitted that its raids on Palestinian homes in the area were part of military exercises. The military activities also included helicopter overflights and intensive presence of troops at the entrances to the towns around al-Khalil city. Israeli soldiers fired, on Monday morning, rounds of live ammunition targeting a number of Palestinian farmers, in their own lands, east of Gaza City. Eyewitnesses said the soldiers, stationed on military towers across the border fence, fired live rounds and smoke bombs on Palestinian agricultural lands, in the Zeitoun and Sheja’eyya neighborhoods, in addition to Juhr Ed-Deek area. They stated the farmers had to leave their lands, fearing harm and additional Israeli military escalation. Israeli soldiers constantly attack farmers, and workers, in Palestinian lands close to the border fence, in the northern and eastern parts of the coastal region. 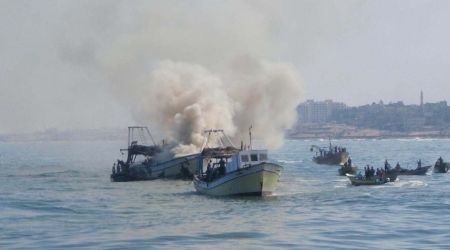 The attacks are largely accompanied by assaults on local fishers, and their boats, in Palestinian territorial waters, and even while docked on shore. 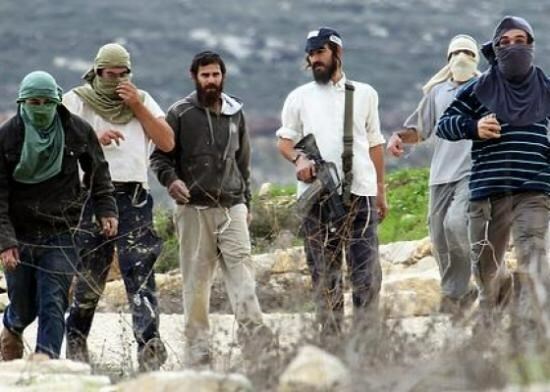 Several Israeli soldiers, accompanied by a number of Israeli extremists, living in a nearby illegal colony, attacked on Monday evening, five Palestinians in a their farmlands, near Bethlehem, and kidnapped them. Ghazal said the kidnapped Palestinians were harvesting Gundelia plants in their lands, in Kissan village, close an illegal Israeli colony, illegally built on privately owned Palestinian lands. Ghazal added that the soldiers held and interrogated the five young Palestinian men for several hours, and moved them to the Etzion military base, south of Bethlehem. The Five have been identified as Sbeih Hasan ‘Obeyyat, Mahmoud ‘Aawad ‘Obeyyat, Omar ‘Ayesh ‘Obeyyat, his brother ‘Aref, and Salman Mohammad ‘Obeyyat; all in their twenties. The website of Israel's second channel on Monday released a video clip showing a group of Israeli soldiers chasing a Palestinian child and unleashing a dog on him. The video recording showed the soldiers laughing and calling the child a coward as the dog was savaging him. The child was crying and seemed to be extremely traumatized. The website pointed out that the incident happened last December near Gush Etzion settlement, adding that the child was detained at the time on allegations of throwing stones at the soldiers. The video clip has been published by the Palestinian Information Center (PIC). A video posted on Facebook Monday by a right-wing Israeli politician, then quickly removed, showed graphic evidence of what Palestinians have reported to be a common Israeli military practice: using dogs to attack unarmed civilians, including children. 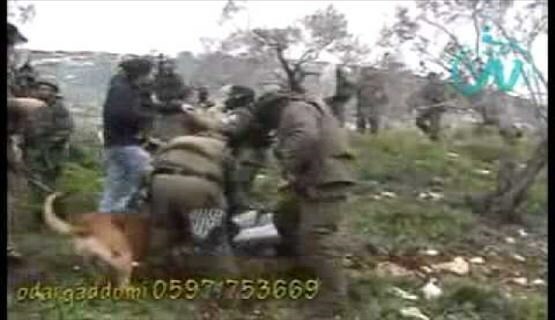 In the video leaked by Michael Ben-Ari on his Facebook page, two Israeli soldiers are holding onto a 16-year old boy, and forcing a dog to bite the child while commanding the dog 'Bite him!' and saying to the boy, 'Who's the coward now?' in Hebrew. The incident in question has been identified as a December 23rd 2014 attack by Israeli soldiers who captured the child in a 'buffer zone' between Beit Ummar, a town located near Hebron in the southern part of the West Bank, and a nearby Israeli settlement built on land stolen from the Palestinian residents of Beit Ummar. Before it was removed, the video was copied and spread around the internet. In response, the Israeli military issued a statement saying that the incident was 'irregular' and 'would be investigated'. 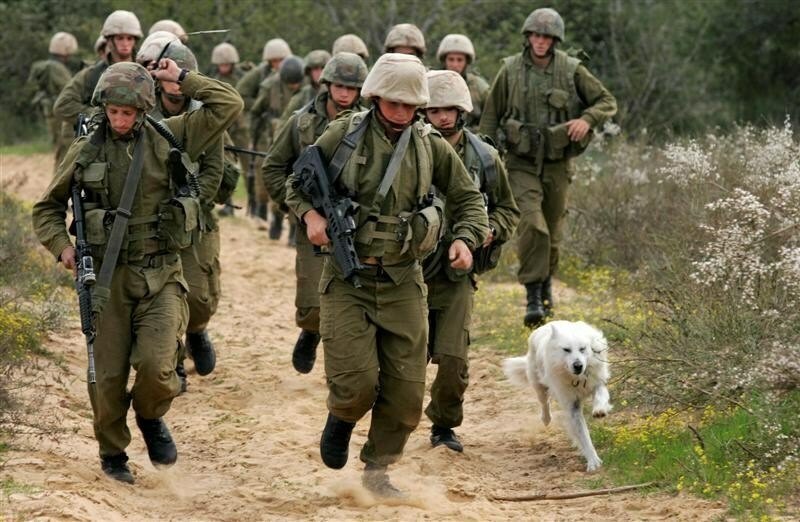 But the Israeli Information Center for Human Rights in the Occupied Territories, B'Tselem, has documented numerous occasions on which the Israeli military used dogs as weapons against unarmed Palestinian civilians. On December 24th, 2014, in fact, B'Tselem posted a report of this particular incident, and video footage of the abduction of 16-year old Hamzeh Abu Hashem. But while the B'Tselem video included a number of disturbing elements, including soldiers chasing down and pinning a 16-year old boy suspected of throwing stones, and an Israeli settler pointing a gun directly at the boy with impunity, the video did not show the actual attack on the boy by the dogs. But the clip posted by Ben-Ari does show the dogs being used as weapons, in an image reminiscent of the use of dogs by U.S. police in the southern part of the country during the civil rights era using German shepherds to attack protesters. According to the B'Tselem report about the incident, posted on December 24th 2014, "At approximately 2 P.M. on Tuesday, 23 Dec. 2014, a confrontation developed between several dozen Palestinians and soldiers in the Special Security Area (SSA) surrounding the settlement of Carmei Tzur, south of Beit Umar in the West Bank. The area is the site of frequent confrontations between soldiers and Palestinian residents of Beit Umar, whose land was appropriated for the settlement and the SSA. "The SSA, which is supposed to serve as a buffer zone that no one but security forces may enter, was established on privately-owned Palestinian land. The owners need to obtain a special permit to reach and cultivate their land, but such permits are issued for only several days a year. 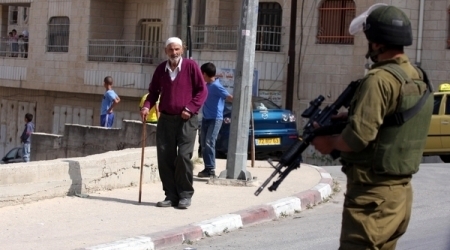 In contrast, security forces allow settlers free access to the stolen land. "Video filmed by B’Tselem camera volunteer Muhammad ‘Awwad. The footage shows the soldiers with the attack dogs on village land and the arrest of 16-year-old Hamzeh Abu Hashem, but not the attack itself. Further on, soldiers are seen taking the teen into the SSA and locking the gate behind them, after which Palestinians verbally confront them, demanding his release. A settler, probably the settlement’s head of security, is seen cocking his weapon and the soldiers do nothing to stop him. 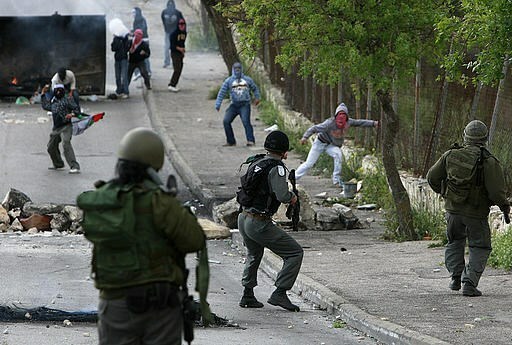 "During the confrontation, Palestinians threw stones at soldiers, who responded with use of crowd control weapons. About an hour after the incident began, at around 3 P.M., two soldiers arrived on the spot with two dogs, who were captured on video by B’Tselem volunteer Muhammad ‘Awwad. According to eyewitness reports, one of the dogs (seen lunging forward at the beginning of the footage) attacked and bit one of the Palestinians confronting the soldiers, 16-year-old Hamzeh Abu Hashem. 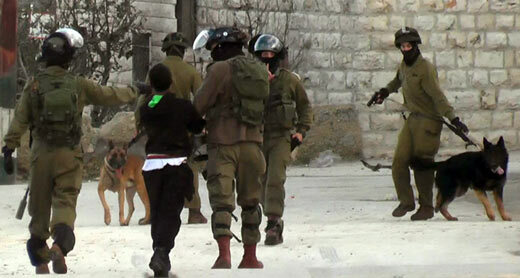 The soldiers then removed the dogs, handcuffed Abu Hashem, and took him to the settlement of Carmei Tzur. From there, he was taken by ambulance to an Israeli hospital. Abu Hashem’s family reported that he was arrested and taken from hospital to Ofer Prison. " Two Palestinian civilians sustained live bullet wounds and dozens choked on tear gas at dawn Tuesday in the wave of clashes that flared up between the Israeli occupation forces (IOF) and Palestinian unarmed protesters in Jenin’s town of Qabatiya. 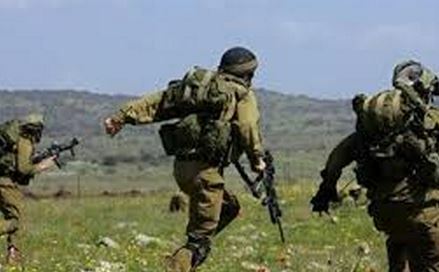 A PIC correspondent quoted local sources as reporting that the IOF stormed Jabal al-Zakarna and conducted intensive military drills before they suddenly cordoned off the area. The IOF troops deployed in the area reached as far as the environs of the Old Mosque in Qabatiya town. Confrontations broke out between the IOF patrols and the Palestinian civilian protesters who voiced firm objection to the raid. Volleys of tear gas grenades were randomly unleashed by the IOF in the process while the Palestinian civilians responded by hurling stones at the heavily armed soldiers, the same sources added. The Palestinian youth Nouh Fudhail sustained live bullet injuries in the attack. The other casualties were not immediately identified. A number of Palestinian demonstrators choked on tear gas and were rushed to hospital for treatment, locals further reported. Safa correspondence, according to Al Ray, said that the Israelis chased some fishing boats off the coast of Sudaneya and the Sea of ​​Khan Younis, and fired at them, forcing them to fish near the coast. He pointed out that the medical staff did not record any casualties among fishermen. Gaza fishing boats are exposed to almost daily harassment from Israeli naval boats scattered along the coast of the Gaza Strip, causing injuries and casualties among fishermen and often damaging or confiscating their boats. 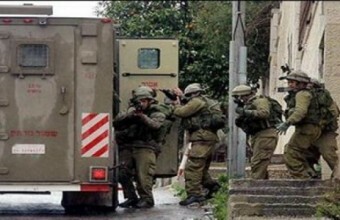 Israeli Occupation Forces (IOF) launched a search campaign in various locations in al-Khalil governorate on Monday morning. Local sources said the IOF soldiers installed military barriers at the entrances of two towns and a refugee camp in addition to the eastern entrance of al-Khalil city. The soldiers searched the Palestinian bypassing vehicles, detained some people and blocked traffic. In a similar context, the Israeli forces stormed a number of Palestinian houses for search purposes. 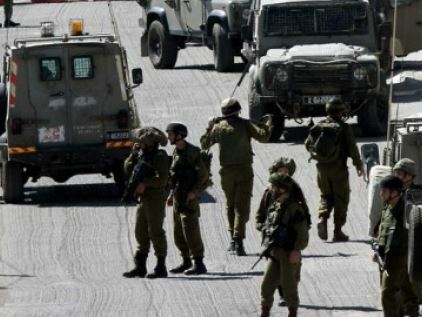 The IOF soldiers were deployed in the vicinity of al-Khalil University; meanwhile, Israeli military vehicles were stationed at al-Khalil’s various entrances. Israeli troops shot and injured two young Palestinian men, Sunday morning, in Duheisha refugee camp, south of Bethlehem, in the southern occupied West Bank. Locals told Ma'an News Agency that clashes broke out early in the morning between young Palestinian men and Israeli soldiers who raided the refugee camp at dawn to detain a young man from his house. The victims were evacuated to Bethlehem district's public hospital in Beit Jala. An Israeli army spokeswoman told Ma'an that, as forces entered the camp, young Palestinians threw a grenade at soldiers who responded with live fire at the lower extremities with .22 caliber rounds. One hit and slight injury was confirmed. Before they left the camp, Israeli troops detained 26-year-old Bilal al-Sayfi and took him to an unknown destination. Israeli forces shot and killed Palestinian teenager Jihad Shehada al-Jaafari in Duheisha camp last week. An autopsy report later showed that the teen was shot in the upper body, at close range. Jafaari's father had called for the autopsy in order to document Israeli crimes and violations against Palestinians. Dozens of Palestinians suffocated by teargas inhalation during confrontations with the Israeli army, which broke into the village of al-Khader, near Bethlehem, according to local sources. Meanwhile, forces abducted shepherds and activists in the Hebron area. Ahmad Salah, coordinator of the Anti-Settlement Committee in the village, said an Israeli army force broke into al-Khader in the afternoon hours, provoking confrontations with local residents. He said that Israeli soldiers opened live fire towards the protesters, yet there were no reports of casualties, according to WAFA. Multiple cases of suffocation by teargas inhalation, as soldiers fired teargas canisters, however. In the meantime, army broke into a medical clinic in the nearby village of Wadi Fukin, checking the identity cards of medical staff and searching the clinic. No arrests were reported in either village. It was further reported that Israeli police arrested two Palestinian shepherds as they grazed their flock in the valley of Umm Zeitouna, near the Israeli settlement of Ma’on in Hebron, late Sunday. According to Operation Dove, in late morning, the security chief of Ma’on settlement and Israeli soldiers arrived in Umm Zeitouna valley where the shepherds, accompanied by international volunteers, were grazing their flock on land which Israeli settlers from Ma’on are attempting to annex. Minutes later, Israeli police arrived and immediately detained two shepherds and two international volunteers. At around 12pm, police abductted the two shepherds and took them to Kyriat Arba police station. The volunteers were released, but the shepherds were kept until about 3pm, after being fined 500 NIS each. Residents of the South Hebron Hills experience continual harassment from settlers in nearby settlements and outposts, but remain steadfast in their commitment to nonviolent resistance. Each day that they graze their sheep in contested areas, the shepherds continue to resist settler attempts to drive them from their lands. International volunteers have witnessed shepherds chased from Umm Zeitouna six times since the start of the year (in five of these occasions the Israeli army came after a settler's call). The arrest followed a nonviolent action that morning, during which residents successfully repaired the road which links At-Tuwani village to Yatta, and the attendance on February 27 of the South Hebron Hills Popular Resistance Committee, at the 10th anniversary of nonviolent action in Bil’in. In related news, Israeli Ofer military court approved the administrative detention order against eight Palestinian prisoners, the Palestinian Prisoner’s Society (PPS) stated Sunday. PPS said that the court approved the administrative detention against four prisoners for a period of six months. The prisoners who received a six month imprisonment sentence without charge or trial were identified as Rami Abu Shalaf, Sliman Battat, mohammed Samaneh, and Mohammed Mimi. Meanwhile, two prisoners from Jenin received a detention period of three and two months. They were identified as Oday Istiti, and Abd al-Rahman Hindyeh, respectively. The remaining two prisoners, who were also from Jenin and identified as Mohammed Salatneh and Ali Kamil, received a detention period of four months. 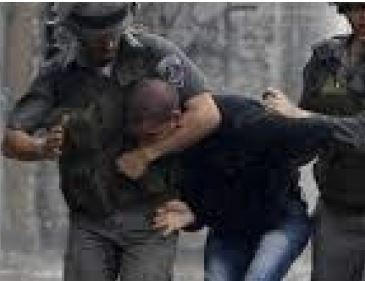 B'Tselem, the Israeli Information Center for Human Rights in the Occupied Territories, stated that "administrative detention is implemented solely on the basis of an administrative order, without either indictment or trial. Under certain circumstances, this type of detention may be lawful. However, due to the substantial injury to due process inherent in this measure, international law stipulates that it may be exercised only in very exceptional cases – and then only as a last possible resort, when there are no other means available to prevent the danger." Nevertheless, Israeli authorities routinely employ administrative detention. Over the years, thousands of Palestinians have been held in Israeli custody as administrative detainees for extended periods of time, the center said.